This issue of Clinics in Geriatric Medicine, Guest Edtied by Drs. 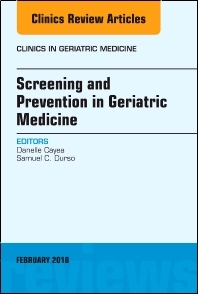 Danelle Cayea and Samuel C. Durso, is devoted to Screening and Prevention in Geriatric Medicine. Articles in this issue include: The Medicare Annual Wellness Visit; Individualized Cancer Screening; Frailty; Medication Appropriateness; Geriatric Syndromes; Mental Health; Cardiovascular Screening; Preoperative Screening; Safety; Substance Use Disorders; Sexuality; Vaccines; and Excercise.